Notes from the Intel Channel Conference Lite (ICC) in Red Deer, Alberta. To keep things simple and easy to search for there will be several posts covering different Intel product areas. Since the release of the Q series Executive desktop boards, Intel has really poured on about Active Management Technology (AMT) that is built into the Executive series boards. When we started building on the DQ965GF series board, AMT was an attractive element to the new Executive series boards. But, at that time there was one problem to the whole thing: When we were investigating the product and its features, it was indicated to us that we were going to need to outlay a large sum of money on third party applications to get the whole thing working. And, due to the newness of AMT, they were not kidding. So, we essentially left it alone. From Out of Band management which is no power or OS to the system needed to connect and work with the system at the BIOS level, to rIDE (Redirect IDE) which can redirect a system to boot from an ISO hidden on the system's hard drive to restore it back to the image state there are some pretty neat features. The ability to manage a system right down to the minutiae is possible with AMT. The first thing one must know is that AMT on the Q series desktop boards is disabled out of the box. One must go into the BIOS and set a password to access the AMT features. Once that has been done, one can access some simple management features by directing a Web browser to http://192.168.22.227:16992 (IP or system name works with port 16992). We don't have a screen shot yet, as we don't have any of our DQ965GF/DQ35JOE AMT features activated! We will make sure to activate them on JOE (previous blog post) when we get back to the shop though. One other aspect of AMT that came to light today: There is a free utility from Intel that can be used to manage any Q based system with AMT activated on the LAN. 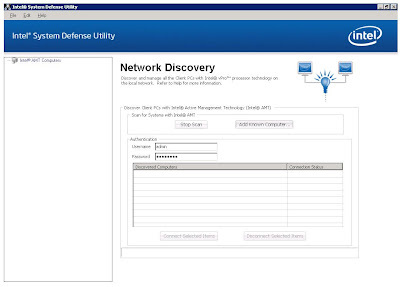 The utility is called the System Defense Utility. It does not offer remote access from outside the LAN, but it is definitely a step in the right direction for managing a number of AMT activated systems. So, we have the ability to get to the system via a Web browser, or the System Defense Utility independent of any OS being active or not. While these means of managing systems are excellent in and of themselves, the thing that should get us to stand up and take note is: AMT management features are available to Microsoft System Center Essentials (SCE). Why is this important to us? Because SCE is included with SBS 2008 Cougar! (Microsoft's SBS FAQ) and, SCE will also now be included and licensed with the new "R" code Intel Server Boards ( previous ICC blog post). Think about the possibilities that this integration gives us. With SCE, we should be able to funnel all of our client's system telemetry into our shop for at-a-glance management. We can charge monthly fees for this service. Or, we can augment our Platinum Level Managed Services Agreement (Karl Palachuk's excellent series on converting an I.T. 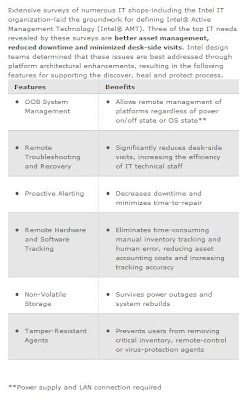 business model to a Managed Services model in a Month) with these management features if we haven't already done so. Being that we are a small shop, we prioritize all of the info that passes by us. In this case, we will be giving our investigations into AMT a top priority. Why? Because we can augment our already comprehensive preventative maintenance services we provide our clients with the ability to deepen our proactive management of their systems. By the way, some laptop models are now being shipped with AMT built in. They will have "Centrino Pro" indicated on them. Keep that in mind when quoting clients that are primarily running their businesses on laptops. It would not be too difficult to justify the additional costs on the laptop with a demonstration of what AMT can do for them and for our ability to be there for them. Intel's Active Management Technology product site. AMT at Wikipedia provides an excellent explanation as well. All in all, with Intel Server Boards and now the DQ965GF and DQ35JOE series desktop boards, we have a really good edge on competing with Tier 1's like Dell and HP. We are getting closer and closer to being able to offer the same level of proactive support that the Tier 1's have. So, I totally agree with you. As I have a bit of time this week, I will hopefully be posting a lot more info and screen shots on AMT and the software technologies to run it.